All my original compositions and recordings are theme-related and have been inspired by a wish to inspire or share inspiration. As of 2018, I have made these recordings available as digital downloads from iTunes and CDbaby. Why did it take so long? I think I can speak for all creative artists: just as soon as we finish a major creation, we learn and grow from the in-studio process such that we outgrow the work before it even goes public. I love Picasso’s quote when asked to name his favorite painting. “My next one,” he replied. I’ve also composed and produced unique tracks for my books and string orchestra scores. My two dozen published string orchestra scores were among the first to feature American and world styles as well as structures that support improvisation. The audio for my books and scores offer backing tracks with real instruments (not MIDI) and coordinate with The Contemporary Violinist and Rockin’ Out with Blues Fiddle as well as Bollywood Strings, TechnoStrings and A Cinematic Journey. 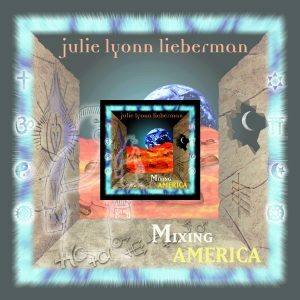 Personnel: Julie Lyonn Lieberman, violin and voice; Armen Donelian, piano; Dan Kleiman, synthesizer; Jeff Eckels, bass; Steve Johns, drums; Tigger Benford, percussion. Vocalists: Toby Twining, Joan Henry, Shi-Zheng Chen, Tiye Giraud, Mark Johnson, Gregory Purnhagen, and Rebecca Weintraub. Mixing America views the state of our nation from the perspective of Eagle Bones, a Native American shaman murdered while defending his people, his spirit long incarcerated by the glass case that displays his skeleton in a national museum. We see through his eyes the America we’ve created: the self-righteousness that we call racism (The Tree of Thorns); drug addiction, as The Sandman lures us to sleep-walk through our lives; families that fail their children (Orphan Boy) as poverty, hopelessness, and the complexities of immigration overcome them. Lieberman wraps it all up into an expansive musical tapestry that incorporates both standard and exotic timbres, excellent compositional devices, and some of the strangest vocal affectations I’ve ever heard…. I haven’t heard many modern composers outside of film that are able to develop thematic material like this over such a varying stylistic palette. It really showcases her versatility and knowledge of the compositional process. Julie Lyonn Lieberman is a musical blacksmith who brings to her forge many tools to create beautiful, solid pieces of art. Styles vary from B roadway to world music.” The performances on this album are exceptional. All of the musicians and vocalists on this album deserve an immense amount of credit for their work. As most great albums, Mixing America improves the more you hear it. The melodies and harmonies grow more enchanting with repeated listening. 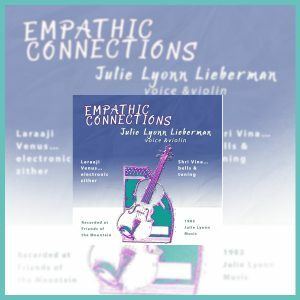 …singer and violinist Julie Lyonn Lieberman has put together an eclectic collection of art songs ranging from dramatic commentaries on society’s ills to several fine tributes to modern jazz. The lyrics are powerful and thought provoking; no surprise, coming from this prolific author of instructional books and tapes covering the history and practice of violin improvisation in the areas of folk, blues, swing, jazz, and New Age music. There is some fine jazz work here…. Lieberman’s singing is at its best when she’s singing wordless vocals in unison with her violin artistry or performing a painful social commentary with dramatic overtones. This experienced jazz musician, teacher, and author has created a fine CD that delivers some unusual written lyrics, powerful vocals, and violin playing that is incredible…would be ideal movie soundtrack material. Personnel: Laraaji Venus, electronic zither; Julie Lyonn Lieberman, violin and voice. This music is a spray of sea water on a brilliant sunny day. It’s a new kind of music, something like High Drone. — Stephen Davis, New Age JournalJulie is not afraid to incorporate dissonance into the evolving soundscape, which is perhaps why the work is able to penetrate so deeply into one’s inner space. Empathic Connections is highly focused for an improvised work – simple, clear and very effective. Julie Lyonn Lieberman (electric violin) and Laraaji Venus (electronic zither) travel through new musical geography: neither earthbound nor sky-bound… someplace in between. Personnel: Julie Lyonn Lieberman, voice and violin; Marty Quinn, percussion; Omar Mesa, guitar; Nancy Chusid, oboe; Steve Browman, piano; Joe Solomon, bass. Julie was inspired by reading about the Orange-red star, Arcturus. Across time this star has been referred to as “Smat,” meaning One Who Rules, and also “Bau” meaning The Coming One. It is considered one of the brightest stars in the northern hemisphere. In 1936, when the earth and Arcturus rotated into a new relationship, it was thought that this produced “akasha,” a high-energy transfer of cosmic influences. Edgar Cayce, the sleeping prophet, often referred to Arcturus as “HIS star.” Cayce maintained that when Jesus left earth, his spirit traveled to Arcturus. Julie Lyonn Lieberman stumbled across this information while conducting research for her book, You Are Your Instrument. She imagined that Arcturus’ energy and intense orange light could affect the evolution of any human receptive to its powers. Artists often serve as visionaries and guides. It was her hope that the music inspired by this star might radiate listeners to ecstatic states of being. 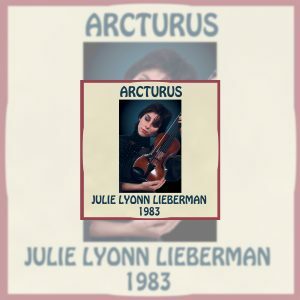 Personnel: Julie Lyonn Lieberman, voice and violin; Dave Samuels, vibraphone; Rufus Reid, bass; Stephen Browman, piano; Geoffrey Gordon, percussion; Martin Quinn, drums; Erik Friendlander, cello. This album is an ode to mother earth. It is a musical story that focuses on a girl who lives in the inevitable future. Oxygen is precious, animals are extinct, and the planet is dying. She journeys into a failing forest and one of the last of the ancient trees conveys the music of the birds. The tree becomes a violin and she transforms into The Roaring Brook Fiddler. Through music, she is able to bring the dying planet back to life. 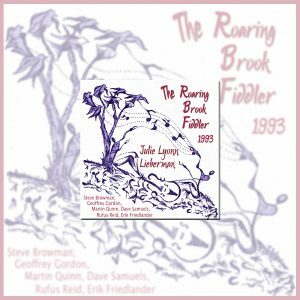 A musical story began to form in my mind called The Roaring Brook Fiddler, the story of a young girl from the “inevitable future” … the future, as it would be if the human race continued behaving as it has. She lives in a glass city with pumped-in oxygen because all the natural oxygen has been depleted. The local zoo runs movies of animals because there are very few left on the planet. Movies of water flowing … fish that swim upstream. After its debut concert and the making of this album, I worked on a national music education project called The Green Anthem. Its lesson plans and theme song eventually reached six million children through The World’s Largest Concert, an event staged by National Association for Music Education (NAfME).